We are revisiting some of our favorite stories during Thanksgiving week. This story has been updated to include a healthy holiday recipe from Shavaun Cloran. The Daily Herd will resume normal publication on Monday, November 26. Ask any student what the most important part of their college experience is, and you’re bound to get at least 12 different answers. Academics, internship and networking opportunities, student life—they’re all important, but there’s one thing that seems to be unanimously revered across campuses. ​Shavaun Cloran is WPI’s registered dietitian and one of the team members responsible for providing students, faculty, and staff with healthy, delicious meals—day in and day out. 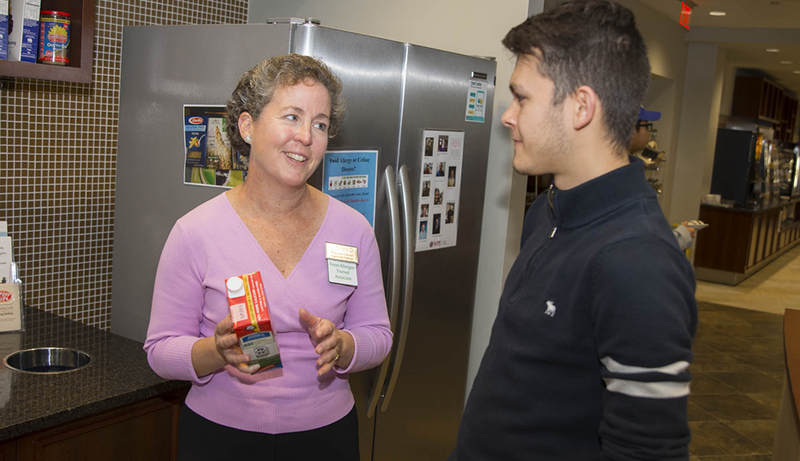 She took a few minutes to describe an average day for her at WPI; one of her favorite recipes; and some surprising facts about her work. While most people might think that Cloran’s work revolves solely around nutritional counseling, that’s not the case. “The majority of my time revolves around food allergy awareness,” she explains. As part of her daily duties she is responsible for the ongoing training of associates and supporting the growing number of students, faculty, and staff with food allergies or Celiac disease; she is constantly researching the best ways to approach this rapidly growing medical concern. Let’s face it—sometimes, it’s just easier to lounge around in pajamas all day instead of venturing outside into Worcester’s biting cold or blazing heat (sometimes happening within days of each other). Cloran’s go-to snack, Oatmeal in a Mug, is full of carbohydrates, protein, and healthy fat, and can be enjoyed as a quick snack or small meal. Best of all? You don’t even need to leave your residence hall to make it. Favorite thing about the WPI community? Cloran says it's possible to enjoy holiday treats with a little thoughtfulness and some intuitive eating techniques. "When you eat what you really want, in an environment that is inviting and conducive, the pleasure you derive will be a powerful force in helping you feel satisfied and content. Choose foods with intent and enjoy!" Listen for the body signals that tell you that you are no longer hungry. Observe the signs that show that you're comfortably full. Pause in the middle of a meal or food and ask yourself how the food tastes, and what is your current fullness level? Continue with some form on enjoyable physical activity during the holidays; it helps us stay in tune with our appetites, stress management, and overall well-being. Cloran shared this recipe for a side dish that is easily prepared, healthy (high fiber, low fat and loaded with vitamins and minerals), and devoid of the top eight allergens and gluten. Place water and wild rice in a pot and bring to a boil. Reduce heat and simmer covered until tender, about 40 minutes. About half of the grain should burst. Strain and place rice in a large bowl. Place dried cranberries in a bowl of hot water and let sit for 20 minutes to soften. Drain and add to bowl with rice. In a non-stick skillet or cast iron pan, drizzle olive oil and heat over medium heat. Cook red onions, stirring often to caramelize. Add mushrooms to the onions and continue to stir and cook until mushrooms are tender. Sprinkle with the poultry seasoning and add celery; cook another minute; season with salt and transfer to the mixing bowl. Add parsley and vinegar to the bowl. Stir well.